The popular standing of President Putin has increased significantly since the outbreak of the Ukraine crisis and the annexation of the Crimea: his approval rating is now at an all-time high of 85% (following an all-time low before the crisis). Nationalistic sentiment has risen, supported by aggressive propaganda through the state-controlled media. Playing the nationalist card, especially in relation to the EU and the US, appears to be the key to keeping approval ratings up in the long term, especially when the sanctions that have been imposed begin to have a real impact on the economy and household incomes. Any opposition has been marginalised by a hardening of authoritarianism: hardliners have effectively been given licence to attack liberals and crack down further on independent media and non-governmental organisations. Since the outbreak of the Ukraine crisis in early 2014 the relationship between Russia and the EU and US has gradually deteriorated. Moscow´s annexation of Crimea in March and its tacit support of separatist forces in Eastern Ukraine triggered the first round of sanctions from the EU and the US, mainly in the form of a freeze on assets, together with travel bans on Russian and Crimean individuals and others heavily involved in the conflict. As the civil conflict in the Ukraine escalated between March and July, more individuals and organisations were added to the sanctioned list. As well as the increase in fi ghting, a turning point was the shooting down of a Malaysian Airlines plane over contested territory in Ukraine, with the loss of 298 lives. The response from the US and the EU was the imposition of even tougher sanctions on Russia. These consist of long-term fi nancing limitations restricting access to EU/US capital markets for major Russian state-owned banks (Sberbank, VTB, Vnesheconombank, Gazprombank and several others), and restrictions on the export of certain types of products to Russia, including dual-use technologies and high-tech equipment for the oil industry. Those sanctions may have a very signifi cant impact on the Russian economy in the longer term. In particular, they will influence the refi nancing capacity of major domestic corporations and banks. In early August, Russia announced retaliatory sanctions on the import of food and agricultural products from the EU, the US, Australia, Canada and Norway. A further escalation of fi ghting in the Ukraine, coupled with increasing evidence that Russia tacitly supports the separatists with regular troops, has led to another round of sanctions by the EU, effective from 12 September. These include barring five Russian state-owned banks from lending or selling stocks or bonds with more than 30-day maturities. Three Russian defense companies and three oil companies (Rosneft, Transneft and the petroleum unit of Gazprom) will be barred from raising capital in the EU. Additionally, curbs on European assistance for Russian oil exploration and production have been imposed. Restrictions were also widened on the sale of civilian equipment and electronics that have military applications. In line with those measures, the US also tightened its sanctions against Russia. In 2013 the Russian economy grew by just 1.3 % - the slowest pace since the 2009 recession - as both consumer demand and investments were weak and export performance sluggish. Partly as a result of the Ukraine crisis, this weak performance continued into 2014, with GDP increasing just 1.1 % in the first half of the year, due mainly to declining investments. environment. While a small rebound is expected in 2015, the longer-term outlook is subdued as the already too low level of investments will feel the impact of sanctions even more: mainly in vital new technology and finance. Falling confidence in the Russian economy is evident from capital outflow: a massive US$ 62 billion in the first quarter of 2014 and a total of US$ 87 billion in the fi rst half of the year. That outflow consist of the acquisition of foreign assets by firms and banks (the so called ‘capital fl ight’), foreign currency deposits taken up and held outside the banking system and net borrowing by the private sector. It is expected that the capital outflow will reach US$ 100 billion by the end of 2014, compared to US$ 65 billion in 2013. The lower capital outflow expected in the second half of 2014 can be explained by the fact that the EU/US sanctions started to impact the rollover of foreign loans and new borrowing abroad, which decreased sharply in the fi rst half of the year. In view of the lower capital outfl ow in the second half of the year, pressure on foreign reserves will be eased, but not halted. Capital outflow and increased political and economic uncertainty have led to increased currency volatility. 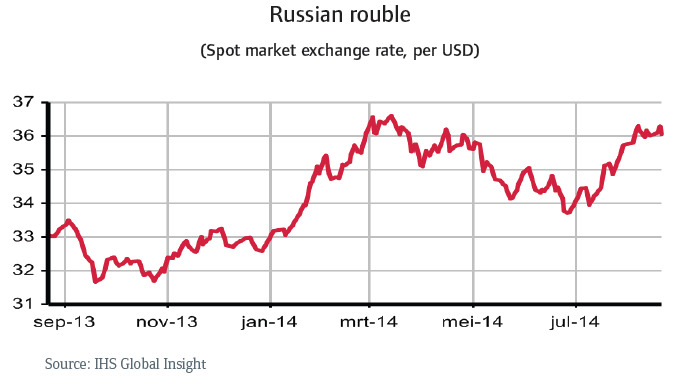 Over the last 12 months, the rouble has lost about 8 % of its value against the US$ and the euro. As a consequence, the Russian Central Bank has repeatedly intervened to sustain the exchange rate: since February raising the benchmark interest rate three times, from 5.5 % to its current 8 %. The very high capacity usage in the Russian economy has led to high infl ation, and this has been aggravated by the rouble’s depreciation. The inflation rate was 7.5 % in July (official target: 5 % at year-end). Given a further moderate rouble depreciation in the second half of the year, infl ation is expected to increase to more than 7 % in 2014. 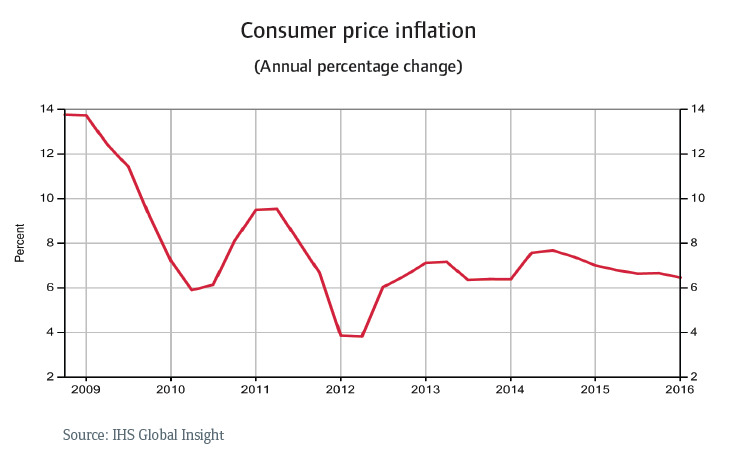 Besides the target of supporting the exchange rate (see above) the Central Bank´s repeated interest rate hikes have also been aimed at taming inflation. However, the recently imposed import ban on EU food will further aggravate infl ationary tendencies, with more local production driving up the cost of necessary resources. The rouble’s depreciation and increasing inflation will together severely hamper growth in private consumption, which is expected to slow to 0.4% this year. Several measures have been taken to reinforce the financial system since the Central Bank stepped up its supervisory role from mid-2013. These include the closure of (mostly smaller) banks, a clamp down on predatory lending practises and the implementation of a deposit insurance scheme. However, the recent EU/US sanctions are expected to strain Russia´s fi nancial sector and thus to have a signifi cant impact on the Russian economy in the longer term, restricting the refi nancing capacity of major domestic banks and corporations. In particular, the sanctions will greatly limit the ability of major Russian banks and corporations to refi nance their corporate debts in Western capital markets. Foreign funding of Russian banks, particularly via the bond market, has effectively ended. There is extreme reluctance in the markets to provide funding to Russian fi rms and banks as long as the Ukraine crisis continues and additional sanctions are looming. Borrowing costs and non-performing loans both continue to increase, detracting from banks´ profi tability (as evidenced by the Gasprombank´s loss in Q1of 2014) and leading to loan restrictions for Russian businesses. The banking sector’s woes are clearly compounded by foreign capital outflow. However, given the still solid state of Russia´s public fi nances, businesses and banks can rely on public support. But, while support from the government and the Central Bank will be suffi cient for the time being, if the Ukraine crisis escalates or persists, Russia may fi nd it hard to sustain fi nancial support in the long term. 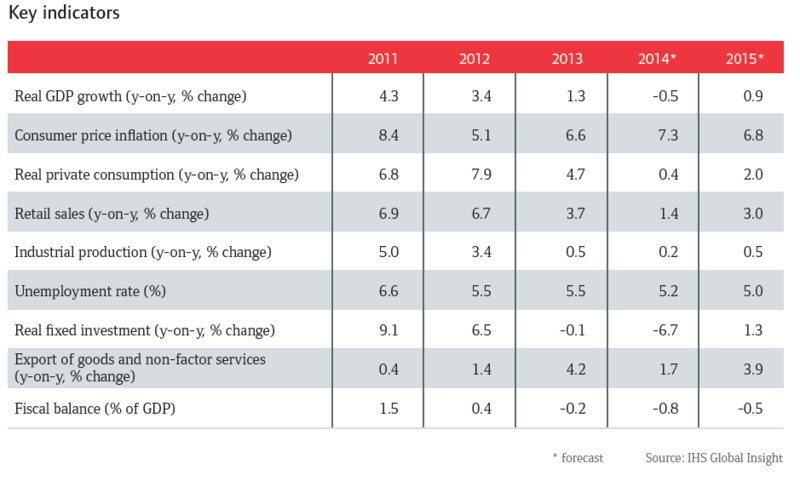 Russia´s fiscal position still looks robust. Public debt has been relatively stable at 8 % since the global credit crisis of 2008/2009 and is even set to decline in 2015. In the fi rst half of 2014 the depreciation of the rouble boosted the value of oil and gas revenues (which make up around half of federal budget revenues) and also helped other exporting businesses that are large taxpayers. The budget was consequently revised upwards over the summer, with a reprioritisation towards spending in the annexed Crimea region. To support the ailing economy, the government plans to spend 60 % of its US$ 90 billion National Reserve Fund (NRF), mainly on infrastructure projects. Russia´s external economic position remains strong, with external debt at 34 % of GDP in 2013 (2012: 32 % of GDP), of which only 4 % is government guaranteed. 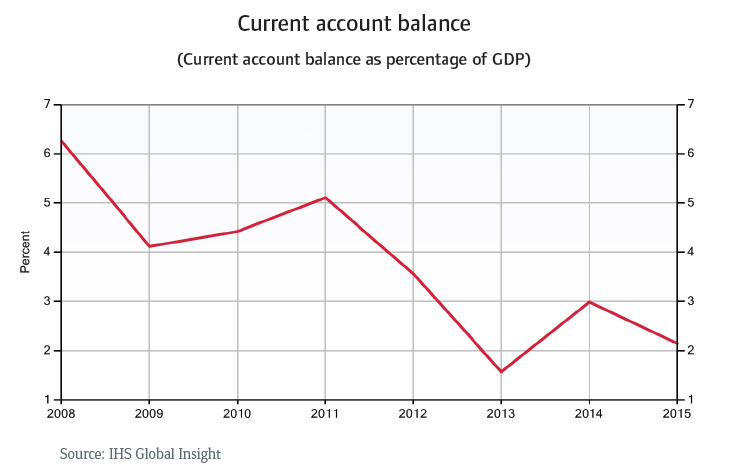 Its current account surplus more than halved in 2013, from US$ 71billion (3.6 % of GDP) in 2012 to US$ 32.8 billion (1.6 % of GDP). However, in the first half of 2014 higher oil and gas earnings and lower imports (down 5 % year-on-year) contributed to an increase, as a result of which the current account surplus is expected to reach 3 % of GDP in 2014 (see chart below). That said, capital outfl ows rose to US$ 87 billion in the fi rst half of the year, exceeding the current account surplus. As a consequence, international reserves declined by US$ billion from US$ 467 billion. Since capital outflow peaked in the first half of 2014, pressure on foreign reserves (still expected to be comfortably high at about US$ 450 billion by the end of 2014) will be eased for the time being. However, with no sign of relief from sanctions, the decrease in foreign reserves should continue, as the forecast current account surpluses of 3 % of GDP in 2014 and even less in 2015 will be insuffi cient to bolster capital outflows. Despite its strong macroeconomic fundamentals, the Russian economy suffers from structural weaknesses that, given current circumstances, could be laid bare even more clearly than in earlier years. Even before the outbreak of the Ukrainian crisis, the investment level was too low and foreign direct investment too limited, and the economy is overly dependent on oil and gas production (oil and gas represent more than 75 % of Russia’s total exports) and consumption. The authorities failed to seize the opportunity during the windfall years to strengthen Russia’s economic structure and enhance its non-oil potential by prudently investing high oil revenues in other industries to diversify the economy away from the dominant oil and gas sector. Today the country is more dependent on its energy resources (i.e. high oil and gas prices) than ever, but state intervention – leading to an unfriendly business environment - has deterred foreign investors, hampering vital investment in exploitation and new exploration. In both the energy and the manufacturing sectors, productivity is still far below that of other industrialised countries. 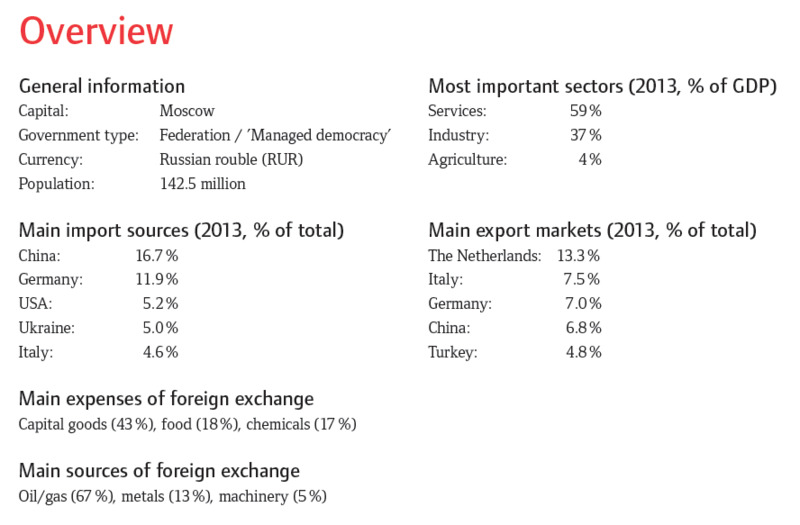 Russia’s domestic economy is heavily monopolised, with market-oriented and competitive small and medium-sized businesses contributing only about 15 % of GDP. Instead, state-controlled giants or private companies loyal to the state dominate the economy. A lack of reform effort and market orientation has so far hindered the emergence of a strong, competitive private sector except for the main oil and gas producers. Moreover, the executive and judiciary system lacks transparency, often leading to apparently arbitrary decisions, and Russia´s bureaucracy is notoriously cumbersome. Given the current situation, investment will be even lower because of capital outflows (including lack of new finance) while the rouble’s depreciation, coupled with accelerating inflation, will discourage private consumption. Sanctions will hamper, and perhaps halt, the inflow of technology and capital in the form of foreign direct investment, at a time when both will be urgently needed to modernize the energy sector and diversify the economy. In the worst case scenario, the Russian economy could be forced down a path towards international economic isolation. Currently nearly all Russian industries are increasingly impacted by decreasing domestic demand, a weaker rouble exchange rate, a rise in inflation, limited access to external financing and international capital outflow. However, some sectors are more affected than others, especially those that are heavily dependent on imports and or/ consumer demand, such as consumer durables and consumer electronics. Russia´s sanctions on imports of food and agricultural products will hit the domestic food sector, in particular the fish, meat and dairy subsectors, with a negative impact on the whole value chain - from importers and wholesalers to major retail chains and smaller regional traders. In the last couple of months we have already registered an increase in overdue payments and defaults in consumer demand-related sectors like food and consumer durables, and we expect that more Russian importers and retailers of such goods could come under strain in the future, especially in the food sector. While the oil and gas industry is still performing well thanks to high commodity prices, businesses in other strategic sectors such as metals & mining are suffering, and may not be able to refinance their large debts. While the Russian government is ready to provide financial support, its reserves, though ample, are limited. However, some sectors, such as the pharmaceuticals sector, are expected to be less impacted and local agricultural production could even benefit from restrictions on food imports. In case of price controls, however, business profits may be hit given higher costs that cannot be transferred to consumers in such case.